We are experiencing exciting and busy times with the ASH Project right now. The running shed at Sheffield Park is a hive of activity as AIVAF, the interactive fit-out contractors, have moved in and are quickly converting the north end of the building into something resembling an exhibition space. The week beginning 13 Aug., 2018, will see the walls furnished with exhibition boards, and the interactives--including the Stepney Driving Experience--are being installed during the week beginning the 27 August. Keen-eyed Railway goers will have spotted that some of the engines have been put back in the shed ready for the exhibition. "Stepney", "Normandy", the Adams Radial, E4, and No. 75027 forming the main part of the exhibition locomotives, with raised platforms to view these engines from different angles. After a snagging and testing period, we will be looking forward to reopening the running shed and the SteamWorks! exhibition to the public. Access to the south end of the building and the "working" running shed will be as before,with visitors able to view the locos from ground level and to see the engines over the maintenance pits when there is no movement in the shed. I am still interested to hear from members who would like to volunteer as guides and explainers for the exhibition space: contact me at 01825 720800 or ruth.rowatt@bluebell-railway.co.uk . A festival event celebrating the project with science as the theme is planned for the first weekend of autumn half term (20-21 October), so look out for further information on that. We can't say we haven't had a summer can we? I can't remember a summer like this since 2003, and despite the odd rain shower and bit of cloud cover, it's been clear blue skies and mid to high 20s for week after week. No. 80151's boiler under construction. For the railway this brings another set of challenges: a dry lineside and the potential for fires. Through careful management of the locomotive the risk can be reduced, and despite the odd small lineside fire, we've faired very well. The welfare of the crews in this heat is also vitally important with the spare crews and loco yard volunteers all doing their bit to help those rostered on the engine. Inside the loco works, we've been undertaking some improvements to the machine shop through the installation of a 1-ton capacity electric post crane. This crane will serve a number of lathes and milling machines and significantly reduce the amount of manual handling required. We've also been improving our storage with the purchase of cabinets and racking for our tools. Our boiler team has continued to focus on the overhaul of BR Standard Class 4 tank No. 80151, with installation of stays now 99% complete and attention focused on fabrication and trial fitting of the ashpan. The smoke tubes and flue tubes have arrived, including the specialist machined "bottle ends". Once the boiler has been rolled over to replace a number of crown stays, it will be placed upright ready for installation of the tubes and flues. There is a small amount of specialist welding to complete, but we're now firmly on the last lap, perhaps with 350 meters to go, using an athletics analogy. Off-site work continues on the boiler of SR Schools class No. 928 "Stowe" with the repairs to the inner firebox now complete and each component bolted together. Work is now proceeding on drilling and de-burghing the lap seams before the whole assembly can be temporarily bolted together before final riveting takes place. Work on the chassis continues with the final axlebox being machined and preparation of the frames on-going. Two significant milestones were reached in the department recently. Firstly the re-wheeling of BR Standard Class 2 tank No. 84030 and the housing of the loco in the new polyshed tunnel. This work is a significant step forward for the project; congratulations to the class 2 team and all those involved. The second significant milestone is the return of No. 34059 "Sir Archibald Sinclair's" boiler. The boiler arrived from South Devon Railway Engineering on 9 Aug., 2018, and it was promptly placed on the accommodation bogies and shunted into the Works. The overhaul of the boiler has suffered some setbacks since leaving Sheffield Park, with a change in supplier midway through, delays in pressing the new throat plate, and new gusset stays and outer wrapper boiler platework being required, but the end product is now with us. Once the work on No. 80151 is complete, attention will turn to completing this overhaul. I'm very grateful to all those who have contributed, both physically and financially, to the loco's overhaul. Elsewhere in the Works we have been completing the repairs to BR Standard Class 5 No. 73082 "Camelot", with both the new piston heads machined and installed and all the new cylinder covers bolted in place. The final fitting of lubrication pipes, cladding, and other items is now taking place ready for testing and a return to traffic in the coming weeks. The Railway has its autumn steam gala on the 12-14 October. Two high profile visitors will be running alongside our own locos, so if you haven't had a chance to visit over the summer, we look forward to seeing you in October. After being away for five years, the boiler for No. 34059 "Sir Archibald Sinclair" has returned to the Railway. During its time away, it has had new sides to the outer wrapper of the firebox and a completely new inner firebox and foundation channel. This work has been financed by the "Keep Up the Pressure Fund", The Bluebell Trust, and the Bluebell Railway BOB loco group. The photo shows the boiler being unloaded early on the morning of 9 Aug., 2018. It has been moved into the workshop in readiness for work to commence on re-staying and the fitting of smoke and flue tubes. A return to steam is hoped for within the next one to two years, subject to the usual caveats. Reviving Memories of "Number Nine"
By Graham Aitken, BRPS Chairman; Senior Station Master, Sheffield Park; Guard; Lifelong fan of No. 60009 and the "Waverley Route". I hope that by now you are aware that the two visiting locos for this exciting event are: A4 No. 60009 "Union of South Africa" and B1 No. 61306 "Mayflower". The former loco-"Number Nine" as she is frequently referred to-is very special to me for many reasons. As a boy I lived in Eskbank, 8 miles south of Edinburgh, with a station on the famous Waverley Route between Edinburgh and Carlisle, via Hawick. One day in 1961, I became a trainspotter when I wrote down the number No. 60009 in a notebook. Little did I know the effect that action would have on me. I joined British Rail in 1966, spent 40 years in Train Planning, before taking early retirement and becoming a volunteer on the Bluebell Railway. If only I hadn't seen "Number Nine"! Read more about Graham's recollections and marvellous plans for "Number Nine". The "Giants of Steam" timetable has been published. The Giants return from 12-14 Oct., 2018, with visiting locos Gresley A4 Pacific class No. 60009 "Union of South Africa" (courtesy of the Cameron Trust) and LNER Thompson class B1 No. 61306 "Mayflower" (courtesy of David Buck). Read the timetable here and read more information about the event here . A special intensive timetable will be operating over the weekend, so there will be lots of opportunities to travel behind these magnificent Giants and to watch them in action! After last year's huge success of the Santa Specials, once again they will operate on Saturdays and Sundays on 1-2, 8-9, 15-16, and 22-23 December and there is a special "Train Before Christmas" service on 24 December. Each day there will be three trains: two from Sheffield Park and one from East Grinstead. Tickets have already gone on sale, and it promises to be another great success. As many of you will have experienced for yourself last year either as a visitor or as a volunteer, when our Railway puts on a great show, everyone gets a special buzz, which is exactly what we are planning to achieve again this year. As a result, we need volunteer stewards for all nine days: eight stewards on each of the three trains, so over the nine days, there will be a total of more than 200 on-board stewards' turns of duty to cover. You will appreciate why we need your help. We are therefore recruiting volunteers who wish act as stewards, and the more we can recruit the better. The role of the stewards is to serve refreshments and to look after our visitors during the train journey to and from Horsted Keynes, while being a smart and the friendly face of the Bluebell Railway. All volunteers must be members of the Railway. Owing to other commitments, Roger Sanderson--who has been the on-board train volunteers organiser and roster clerk in previous years--is unable to continue this year, so I have volunteered to take on the role. If you are interested in joining us this December as a steward--either returning to the role or doing it for the first time--please email me at keith.riggs@bluebell-railway.co.uk with your available dates and I will note your interest. It is the intention that in late October/early November I will arrange a get together of all the stewards so that everyone can meet each other and discuss their roles. As many readers will know, the Bluebell Railway has for many years held a free bus service event for preserved vehicles in the autumn. In some years the event has extended to two days, one of them usually tied in with "Giants of Steam" or other special events. However, this time we will be keeping the event to one day only. As event organiser, I am still working on detailed plans for 7 October because, as always, exact volunteer driver and vehicle availability does not become known until quite close to the actual day of operation. However, I can confidently state we shall operate a couple of our usual favourites, namely Service 20 between Brighton, Lewes, and Sheffield Park and Service 88 between East Grinstead, Turners Hill, Ardingly, and Haywards Heath. I also expect to provide some local trips on various routes around East Grinstead and as a "first" this year, one or maybe two trips from Eastbourne to the Railway in the morning, returning in the afternoon. As usual, more details will appear on the Railway's websites as we get nearer to the date. Meanwhile, if anyone wishes to know more--or even has a historic bus or coach they would like to use--please do not hesitate to contact me at d.morgan52@btinternet.com , 01737 823436 (t), 01904 431672 (t), or 07771 828918 (m). The first two photos show one of the bogies for BCK No. 21246 part-way through re-assembly, as seen on 15 Aug., 2018. These photos help to illustrate the extent of the attention being given to these components at overhaul. The left-hand photo shows the brand new coil springs in situation. The right-hand photo shows the brand new pedestal liners (horn guides) welded into place. The third photograph (bottom left) shows the new "Horsted Keynes" designed and manufactured brake gear part-way assembled under fruit van No. 270. THE WORLD'S BIGGEST COFFEE DAY! Join the Bluebell Railway on 28 Sept., 2018, to support Macmillan Charity . Ruth Rowatt will be running the Macmillan Coffee Morning on 28 Sept., 2018, at 11:15 a.m. in aid of the worthwhile cancer charity. "Last year we raised close to £800, and I would like to triple that donation with your help. Usually, people meet for coffee and bring cakes to buy and sell to each other to raise money for Macmillan. "The Railway does the coffee morning in style on the Wealden Rambler set to and from East Grinstead. Bring your cakes and add a donation of £10 for Macmillan and have a lot of fun! We are supplying free teas and coffees (and the train of course!) All money collected or raised by cake sales goes to Macmillan." Booking is essential. To book your place contact Ruth Rowatt on 01825 720800 or ruth.rowatt@bluebell-railway.co.uk . The Bluebell Railway Band in full voice. The Victorians appear to be somewhat amused. From Derek Hayward's Steam Through the Ages gallery . And anuvver nice little number from Derek! Visually, the last couple of months have seen rapid progress on the Camelot Society's CCT Van, and as always, this progress belies the vast amount of preparatory work that has gone into getting this far. The frame has received the first top coat of crimson red, which is as far as we will go with painting the frame until the side panels are on. The roof canvas has been applied, and we are now waiting for the linseed oil putty to dry and harden before we start painting the roof. With the canvassing complete, we have been able to fit the metal strips on the roof above the door openings and start trial-fitting the new side doors. Three pairs of side doors are now fitted, although they still need to have their door furniture (handles, locking bar, door bumps, etc.) fitted. Following that job, they will be taken down to paint up to the first top coat before final fitting. Chris Broadbridge is about to start building the final pair of side doors. Both sets of end doors are already prepared, but we are delaying fitting them because they will cut out much of the light on the inside of the van. The plywood sub floor is now fitted, which involved cutting the plywood panels to size and routing slots where needed to clear parts of the underframe. This work was followed by preparing packing pieces to go between the plywood and the underframe to get the floor at the correct angle (the floor slopes down from each side towards the centre where there is a wooden gutter). Finally the boards had to be drilled and then bolted and screwed to the underframe. Huw Lloyd, on his annual trip from Canada, helped by cutting the bolts to length (a long and laborious job; there are nearly 100 bolts in the floor). Before fitting the floor, new volunteer Phil Peters made a fantastic job of repairing the centre gutter. Meanwhile Roy Peters (no relation to Phil) continues repairing the inside "strap beams" that will be required when we come to assemble the sides. Richard Salmon machined up the new window frames some time ago so we have these "in stock". Many thanks to all who are working on this project; it is impossible to mention everyone by name." So, the reader, if he or she has been following, now knows that Shed 75H has to get engines ready, then put them away before and after each day's running. But there is much, much more to be done in between times. Our roster is broken down into a list of engine duties for all three grades, and a number of duties which are non-engine turns. These tasks can be anything from cleaning engines, to acting as "spare" men (working as required as spare drivers, etc. ), to organising the yard and staff at weekends as a Running Foreman, to acting as "X"-Men. Click on the image to see it as a larger PDF file . From Wikipedia : "The 1T57 'Fifteen Guinea Special' was the last main-line passenger train to be hauled by steam locomotive power on British Rail on 11 Aug.,1968, before the introduction of a steam ban that started the following day. "It was a special rail tour excursion train organised for the occasion from Liverpool via Manchester to Carlisle and back, and was pulled by four different steam locomotives in turn during the four legs of the journey (with two engines sharing the third leg) ..."
Having read the query regarding No. 41312 at the Bluebell Railway in the latest eNewsletter, I thought you might be interested in these three photos taken by me from 2003 to 2006 (clockwise from top left). No. 41312 on shed at Sheffield Park in February 2003 on the first day of that year's Branch Line Weekend. No. 41312 at Kingscote in June 2005 with a works train at the start of the clearance of Imberhorne tip. On 26 Feb, 2006, marking the last day of the "Chesham Flyer", No. 41312 was renumbered as No. 41284 and hauled an appropriate set of three Metropolitan carriages. "The BR Standard Class 2 tanks were also derived from an Ivatt LMS design built between 1946 and 1947. No. 41312 was built in May 1952 at Crewe locomotive works and spent its entire working career on the Southern region. They were nicknamed Mickey Mouse tanks due to the placing of route indicator discs either side of the smokebox that then looked like ears." images from John J. Smith of A4s." A4 No. 60031 "Golden Plover" at Carlisle pulling the Branch Line Society Scottish Rambler No. 4 Railtour on 18 April, 1964. A Great Day for a Cricket Match! The fourth annual Bluebell Railway XI versus Scaynes Hill Cricket Club (SHCC) cricket match took place at Freshfields Cricket Ground, adjacent to the Railway, on 5 Aug., 2018. The recent heatwave suited batting as SHCC opened strongly. However, some very decent bowling by Bluebell Railway's youngsters (i.e., those younger than 50!) restricted the middle portion of our host's Innings to what looked like an achievable total. But the lower order made hay while the sun shone, and SHCC ended up on 190 for 7 from its 35 overs. The Railwaymen replied well, with decent scoring from the top order enabling us to reach 53 for 2 and then for 118 for 4. However, the lower order couldn't capitalise against some high quality SHCC bowling, and the visitors finished on 143 all out. The score was second place to what was another great day blessed by the weather, plus a lovely tea supplied by SHCC and a beautiful setting for playing cricket. Locomotives regularly halted play with long whistles of encouragement as they passed right next to the field. The day was rounded off by a barbecue at the ground and well-earned drinks all round. If you would like to attend this match next year as a spectator and/or for the barbecue, please email me at jwalls1@btinternet.com and I will send details nearer the time. Andrew Kelly opens the batting for the Bluebell Railway. Bluebell Railway XI Captain Stuart Marks, Superintendent of Locos, surveys the Railwaymen's fielding. SR Maunsell S15 No. 847 whistles as she passes Freshfields. Huw Lloyd: A photo of the SECR H class arriving at Horsted Keynes on 6 Aug., 2018, with the vintage set. John Sandys (16 Aug., 2018): "A very wet day spent in the company of the first train of the day hauled by the H class, complete with the Victorian Set, plus the Observation Car. Also a look at progress on the OP4 track laying and the ASH Project." A portrait by Mike Anton: "Taken on 2 Aug., 2018, at HK whilst waiting for Henry's mum Heidi to bring the Q class back up from Sheffield Park. Mr. Wright was doing her driving assessment." John Sandys (9 Aug., 2018): "The rain arrived today and what a relief! Lovely feeling on the face! The H class and S15 were again doing sterling service with the Service 2 trains. Also I was allowed inside the ASH Project Shed today (with permission for an early look; it opens to the public at the end of August). The Locos were shunted inside this morning." Thank you for reading our eNewsletter. It's because of you-- our members, volunteers, visitors, and supporters --that the Railway continues its success. Please continue to support us by passing this issue onto your friends, family, and/or colleagues by , or encourage others to sign up for the twice-monthly eNewsletter at this link . The successful applicant will be responsible for the day to day general repairs around the different stations of the railway. The candidate would ideally be versatile and hands on in all building areas-carpentry, brickwork, and general plumbing-to effectively undertake this role. This is a volunteer post that carries no remuneration or specific hours of duty. However, the successful applicant will require sufficient time and flexibility to effectively undertake this role and have the appropriate practical competences to meet the demands of the post. If you believe you have the right qualifications and experience for this job, please send your CV to lisa.boyle@bluebell-railway.co.uk or contact 01825 724884. Applications must be received by 7 Sept., 2018. The Bluebell Railway is an equal opportunity employer. 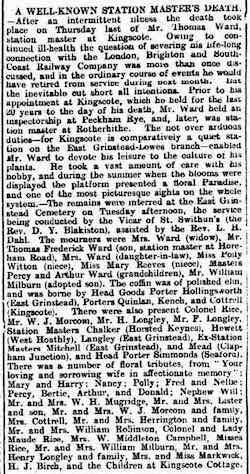 "The coffin was of polished elm ..."
Gordon Dudman follows up his " Early Days at Kingscote " article from our April 8 edition, with a newspaper clipping referring to the death of late 19th century Stationmaster Thomas Ward, which Gordon writes about in his article. Adds Gordon, "I found this piece from the Sussex Agricultural Express dated 7 May, 1904. It came to light in exchanges on Twitter about Queen's Road Cemetery in East Grinstead." Click here or on the image to see a larger file. Santa Specials run on 1-2, 8-9, 15-16, and 22-23 Dec., 2018, and on 24 December the Railway will run a new "'Twas the train before Christmas". Tickets are now on sale for these hugely popular services. SR Q Class No. 30541 Hauls Wedding Special Pullman at Horsted Keynes Bluebell Railway on 11 Aug., 2018, by TrainMania100. Many if not all of the small fittings, including the "sun roof" were taken off the cab structure this weekend [11-12 Aug., 2018] in preparation for the Network Rail Volunteering days, which are happening this week. A team of up to six volunteers per day will be on site to carry out preservation work on the cab. This is not a restoration but work to arrest the deterioration of the cab prior to a full restoration when it is required in a couple of years. The reasoning behind this work is to maintain the plate work as patterns so that drawings can be checked and where required, modified to suit where required. In the photo, we see Sean Smeath beavering away on the removal of the sun roof runners by grinding off the rivets from below and then levering the runner away from the roof using a cold chisel. Read more Project 27 updates here . Berkeley Road station . View NE, towards the junction with the Birmingham-to-Bristol main line: ex-GW and Midland (Severn and Wye) joint line. The auto-train has been propelled from Lydney (Town) over the Severn Bridge by motor-fitted 2021 class 0-6-0PT No. 2080 (built 9/1900; withdrawn 3/52). The latest newsletter from the Standard Class 2 No. 84030 project has been published. View it as a PDF . 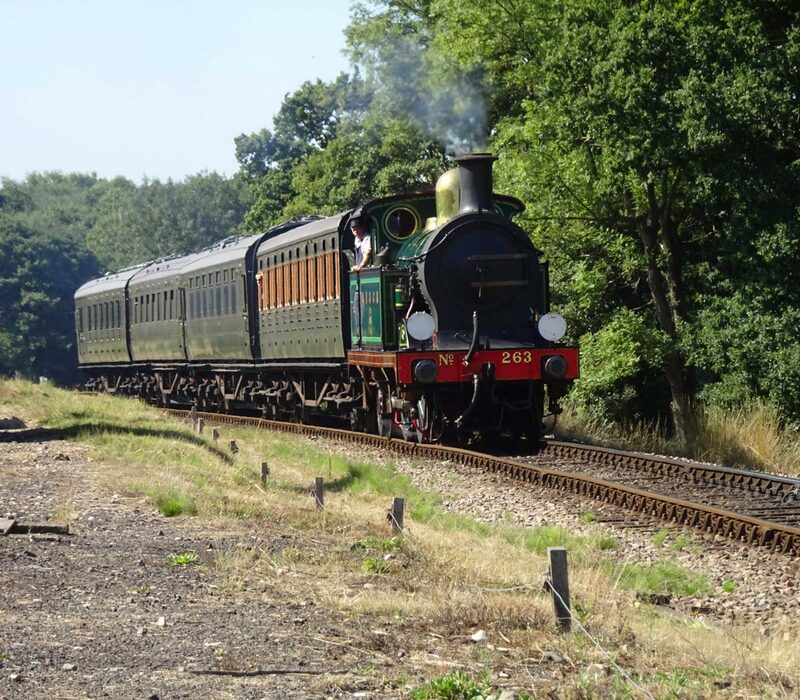 Ashley Smith : "As I had a spare day off with nothing planned on another exceptionally hot day this summer I decided the best thing to do was to park up in the shade at the Bluebell Railway listening to cricket between trains! 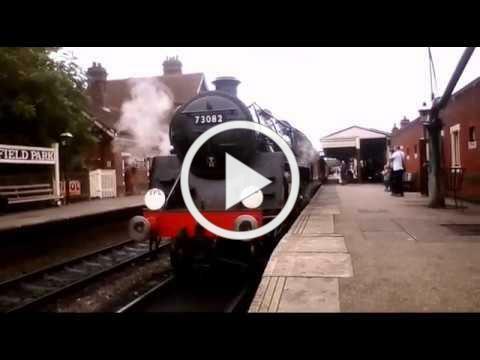 For the summer holidays, the Bluebell Railway run six trains using two locos with O1 no. 65 and S15 no. 847 in action on 3 Aug., 2018. 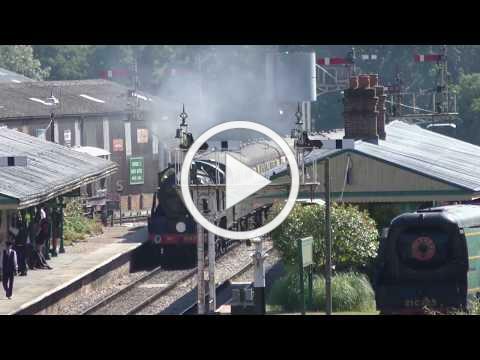 My video starts at New Road Bridge Horsted Keynes as No. 65 brings the first train of the day into Horsted Keynes followed by Imberhorne Lane Bridge East Grinstead as No. 65 tackles the 1-in-55 through the cutting." Mechanical devices attached to points to ensure that they remain fixed for the passage of a train through them. In many countries, they are a legal requirement where passenger trains are operated. Points are also electrically locked by their control system and by track circuits occupied by a train passing through them (detection). Rhyl celebrates as the distance between London and the north Wales resort gets suddenly smaller. Those were the days. Some 60 years before Beeching's cuts, new services were being opened and a crowd has gathered at Rhyl station to welcome the first through train service (not its first day) from London, en route to next stop Colwyn Bay. Somewhere between its arrival and departure, the loco is hung with a handmade sign proclaiming it the "L&NWR Through Train to North Wales ... Rhyl First Stop"
This service began on 1 July, reported the Rhyl Advertiser. The new daily summer service train leaving Euston at 11:15 a.m., arriving at Rhyl at 3:20 p.m. The Rhyl Journal said that on 17 July, Arthur Cheetham "was busy with his cinematograph camera and obtained an excellent series of pictures of the train and the crowd". Two years ago, the Museum launched two quizzes for children (and hid three mice for them to find in the display cases). These quizzes have been so popular that the one for younger children has now been re-printed. Every child who completes the quiz is awarded a badge. No. 73082 "Camelot" on a test run on 15 Aug., 2018, by George Timperley. Will locomotive that train buffs love return to Derby train station? How did one of Britain's last steam locomotives end up stranded in a field on the Essex/Cambridgeshire border? Why are steam trains returning to a Suffolk rail line? Please be advised if you are visiting the Railway during September that roadworks are planned from 1 September to 3rd October on the A22 Lewes Road in Forest Row. Delays are expected. This link has more details . Time for the Minions to go home, shower and chill. Thank you @LynnA72 and @BobGwynne for all your help today. We were at the @bluebellrailway in #Sussex today for a wedding reception with loads of great #Electronic games including the Graffiti Wall, Scalextric, Dance Mats and Racing Sims. Wedding aboard @bluebellrailway Golden Arrow yesterday. Fantastic day! Away fixture in Sussex at another Premier League railway. @bluebellrailway is right up there with @svrofficialsite and a few others, loved the six wheelers which were out today. Our ancestors were hardy folk! Good on the @bluebellrailway's 847 for appearing in Christopher Robin! Great to see Captain Baxter in action at Didcot. you only have to look at Trip Advisor to see how much the Golden Arrow is enjoyed. One year working on the #GoldenArrow #Pullman train @bluebellrailway. Been extraordinary. Today I laid up Fingall at the end of a long shift. I get a lot of joy from working on this #railway. It is also a hard job and the staff of the Golden Arrow should be justifiably proud. More Walks, Gardens, & Attractions!